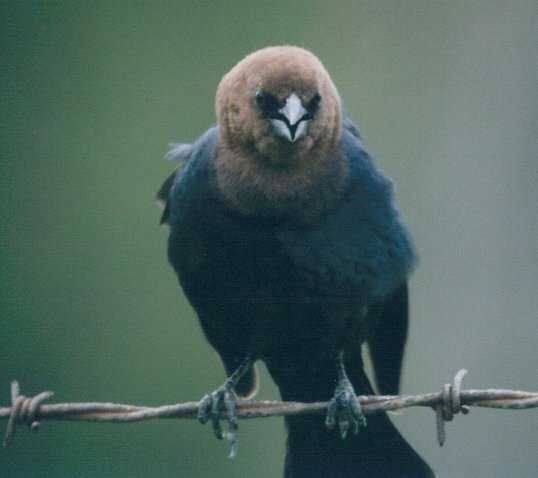 The Brown-headed Cowbird (Molothrus ater) lives in North America, with the breeding distribution from New Brunswick to south-east alaska, and south into Texas and central Mexico. Guys are a greenish-black with brown heads, while the gals are grayish with a black bill. They've got a high-pitched voice, and the gals tend to chatter. They'll eat insects from time to time, but usually seeds. They're classified as brood parasites - that is, the gals will lay their eggs in other bird species' nests, and let them raise the littl'uns. They lay from 1 to seven eggs at a time, with four or five bein normal.